Clove, small, reddish-brown flower bud of the tropical evergreen tree Syzygium aromaticum. Strong in aroma and hot and pungent in taste, cloves are used to flavour many foods, particularly meats and bakery products. Commercial part of this tree spice is unopened flower bud. Clove is indigenous to the Moluccas or Spice Islands (now Maluka), of Indonesia. The clove is an evergreen tree spice belong to Myrtaceae family that grows to about 8 to 12 m in height. Its gland-dotted leaves are small, simple and opposite. The trees are usually propagated from seeds that are planted in shaded areas. Flowering begins about seven to eight years after planting , a tree may annually yield up to 3 to 4 kg of dried buds. The buds, just before the flowers open, are hand-picked in late summer and again in winter and are then sun-dried. The island of Zanzibar, which is part of Tanzania, is the world's largest producer of cloves. Madagascar and Indonesia are smaller producers. Cloves vary in length from about 13 to 19 mm. Climate and soil Clove requires a warm humid tropical climate with an annual rainfall from 150-250 cm. It grows well from mean sea level up to an altitude of 800-900 m. Deep loam soils with high humus content and black loams of semi-forest regions with good drainage are suited for the cultivation of the crop. 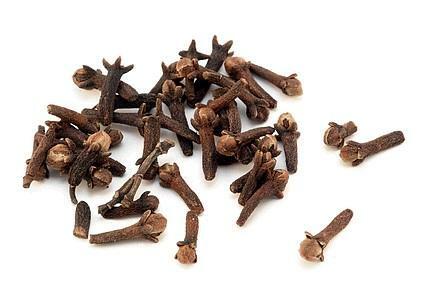 There is no named variety of cloves in India. 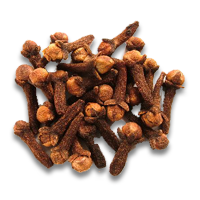 Clove is propagated through seeds obtained from fully developed fruits known as mother of clove. Collect fully developed fruits from regular bearing mother trees. Dehusk the fruits immediately after collection by soaking in water and peeling. Prepare raised nursery beds with fertile soil rich in humus under the shade of trees. Sow the seeds flat at a depth of 2-5 cm and a spacing of 12-15 cm. Water the beds regularly. Seedlings can either be retained in the nursery till they attain a height of 25-30 cm when they are ready for transplanting or potted when they are six months old and transplanted after another 12-18 months. Select partially shaded sites having adequate protection from high winds. Avoid exposed and shady locations. 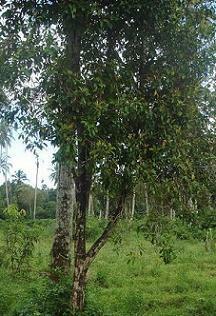 It can be successfully grown as inter-crop in coconut and arecanut plantations. In higher elevations, it can be mix-cropped with black pepper or coffee. Clove prefers partial shade and comes up well at higher elevations, having well distributed rainfall. Under Indian conditions, it is best suited for mixed cropping in older coconut or arecanut plantations or in coffee estates. In order to give a cool humid microclimate, intercropping with banana is ideal. 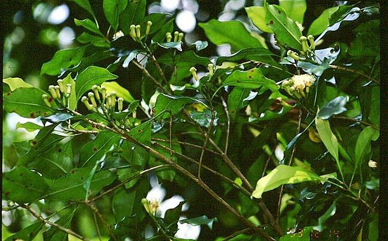 In majority of cases, clove trees are planted in garden lands together with various other crop plants such as coconut, banana, jack, mango and miscellaneous crop plants. The area selected for raising clove plantations is cleared of wild growth before monsoon and select 18 month old seedlings for planting. Prepare pits of size 60 x 60 x 60 cm at a spacing of 6 x 6 m about a month in advance of planting. Allow to weather. Fill up the pits with mixture of burnt earth, compost and topsoil. Plant the seedlings during the rainy season, May-June, and in low lying areas, towards the end of the monsoon, August-September. Provide shade and irrigation during breaks in the monsoon and summer. Banana or glyricidia may be planted to provide shade. Cloves are generally grown as a mixed crop with coffee, coconut, arecanut, etc. Conduct weeding and inter cultivation whenever necessary. Cut and remove dead and diseased branches of full-grown trees to prevent over crowding. Spray 1% Bordeaux mixture to control dieback. Irrigation is necessary in the initial stages. In places where pronounced drought is normally experienced, pot watering is recommended to save the plants in the initial two or three years. Although the trees can survive without irrigation, it is advantageous to irrigate the grown up trees for proper growth and yield. Clove is generally grown as a mixed crop with coffee, coconut, arecanut etc. Apply cattle manure or compost at the rate of 15 kg / tree / annum during May-June. The recommended fertilizer dose is N:P2O5:K2O @ 20:18:50 g/plant during the first year and N:P2O5:K2O @ 40:36:100 g/plant during the second year. Increase gradually the N:P2O5:K2O dose to 300:250:750 g/plant/year for a well grown tree of 15 years or more. Apply organic manures in May-June with the commencement of southwest monsoon. Apply fertilizers in two equal split doses in May-June along with the organic manures and in September-October in shallow trenches dug around the plant about 1 to 1.25 m away from the base. Infests on tender shoots of young plants and can be prevented by prophylactic application of carbaryl 0.15%. Prune off the laterals of old trees showing dieback symptoms. Do not allow dried glyricidia and other twigs to remain in the plantation, to ensure that the beetles will not multiply on these materials and subsequently initiate infestation in cloves. Infests the main stem of young trees at the basal region. The larva of the pest girdles the stem and bores downward into it. The girdled portion and borehole are covered with a mat- like frass material. Many species of scale insects infest clove seedlings in the nursery and sometimes young plants in the field. The scales are generally seen clustered together on tender stems and lower surface of leaves. Scale insects feed on plant sap and cause yellow spots on leaves and wilting of shoots and the plants present a sickly appearance. Scale insects can be controlled by spraying dimethoate 0.05% or quinalphos 0.025%. Three types of symptoms are seen viz., leaf spot, twig blight and flower bud shedding. On the leaves, necrotic spots of variable sizes and shapes are noticed. Severely affected leaves wither, droop and dry up. In the nursery seedlings, dieback symptoms are seen. Extension of the symptoms from the leaves through petioles results in the infection of twigs. The affected branches stand without leaves or only with young leaves at the tips. The flower buds are attacked by spread of infection from the twigs. Shedding of flower buds occurs during periods of heavy and continuous rainfall. Spraying 1% Bordeaux mixture at 1-1 1/2 month intervals reduces disease intensity, defoliation and flower bud shedding. The spraying has to be commenced just prior to flower bud formation and continued till the harvest of flower buds for effective control. Destruction of the weed Clerodendron from the clove garden is recommended to reduce the disease since the pathogen survives on this weed during adverse conditions. Seedling wilt is a serious problem in majority of the nurseries and causes 5-40 % death of seedlings. The leaves of affected seedlings lose natural lustre, tend to droop and ultimately die. The root system and collar region of the seedling show varying degrees of discoloration and decay. The foliage may be sprayed with Bordeaux mixture 1% and the soil drenched with copper oxychloride 0.2%.Since the infected plants promote further spread of the disease, they are to be removed and the remaining seedlings should be treated with carbendazim 0.1% both as spray and soil drench. The infection starts as dark diffuse patches at the leaf tip or margin and later the whole leaf rot resulting in severe defoliation. The foliage of affected trees should be sprayed with carbendazim 0.1%. Prophylatic sprays with Bordeaux mixture 1% also prevents the disease. The disease is characterized by the appearance of dark brown spots with a yellow halo on leaves and such spots also appear on the buds resulting in their shedding. Prophylatic spraying with Bordeaux mixture 1% prevents both the diseases. The trees begin to yield from 7-8 years after planting. The stage of harvest of flower buds determines the quality of the final dried product. Buds are harvested when the base of calyx has turned from green to pink in colour. If allowed to develop beyond this stage, the buds open, petals drop and an inferior quality spice is obtained on drying. Prior to drying, buds are removed from the stem by holding the cluster in one hand and pressing it against the palm of the other with a slight twisting movement. The clove buds and stems are piled separately for drying. Buds may be sorted to remove over-ripe cloves and fallen flowers. Drying should be done immediately after the buds are separated from the clusters. If left too long in heaps, they ferment and the dried spice has a whitish shriveled appearance (khoker clove). The traditional method of drying is by exposing them to sun in mats. The green buds are spread out in a thin layer on the drying floor and are raked from time to time to ensure the development of a uniform colour and to prevent mould formation. In sunny weather, drying is completed in 4-5 days giving a bright coloured dried spice of attractive appearance. During drying, clove loses about two-third of its original fresh green weight. When properly dried, it will turn bright brown and does not bend when pressed. The dried cloves are sorted to remove mother of cloves and khoker cloves, bagged and stored in a dry place. The stem after separation of buds is dried in a similar manner as the spice, without allowing mould formation and fermentation.